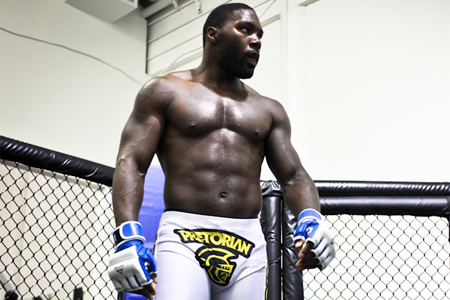 After 13 professional mixed martial arts fights, Anthony Johnson (Pictured) has finally found a place to call home – actually, make that two new places. “I weigh 215 [pounds] right now. I still feel great,” Johnson stated during Wednesday’s UFC 142 conference call. “The weight is gonna come off, no problem. This is easy. This is going to be a lot of fun for me. That’s why I feel so good because I don’t have to cut the weight that I used to have to cut. Despite compiling a respectable 10-3 mark in the welterweight division, “so far” it appears he’s done with his old weight class. Johnson admitted that not having to count every single calorie he consumes has helped ease the stress on his latest training camp. The middleweight division isn’t the only place Johnson has started anew. After previously honing his skills with the famed American Kickboxing Academy, Johnson has taken his talents to Boca Raton, Florida to perfect his game with an upstart MMA squad. Vitor Belfort welcomes Johnson to the middleweight division next Saturday at UFC 142 in Brazil.